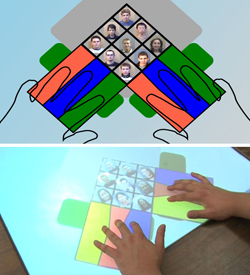 The introduction of tabletop interfaces has given rise to the need for the development of secure and usable authentication techniques that are appropriate for the co-located collaborative settings for which they have been designed. Most commonly, user authentication is based on something you know, but this is a particular problem for tabletop interfaces, as they are particularly vulnerable to shoulder surfing given their remit to foster co-located collaboration. In other words, tabletop users would typically authenticate in full view of a number of observers. In this project, we introduced and evaluated a number of novel tabletop authentication schemes that exploit the features of multi-touch interaction in order to inhibit shoulder surfing. In our pilot work with users, and in our formal user-evaluation, one authentication scheme - Pressure-Grid - stood out, significantly enhancing shoulder surfing resistance when participants used it to enter both PINs and graphical passwords.